By Deloris Jordan & Roslyn Jordan, Simon & Schuster. Ages 4-8. This book of brilliant color, fun, and “throw back” imagery is filled with LOVE and JOY. 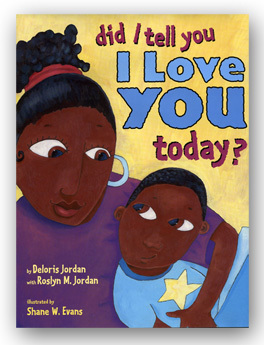 Written by the mother and the sister of one of the most dynamic athletes of our day, Michael Jordan, this book expresses a mother’s love for her children. Evans calls this book “simple but hip.” Simple but hip to the point of LOVE.